I love chiles rellenos (stuffed chiles). I like them in the traditional way – friend in an egg batter and topped with a mild chile and tomato sauce. I like them as cool rellenos – peeled long green chiles served cold stuffed with guacamole, or shrimp, or salpcion (spicy shredded chilled beef) or even chilled tuna salad. My favorite way is fried in a crumb batter. My mother used to crush saltine crackers for the crust. Now we have access to Panko crumbs – Japanese style bread crumbs, which make it easier to have crispy crunchy rellenos. As much and I love them and enjoy them, I’m not at all fond of cleaning up after frying or figuring out what to do with left over cooking oil. And, yes, I know I’ve written about this way of making rellenos before, but it is worth repeating. Chiles rellenos con huevos. I leave my yolks runny so I can dip a bite of relleno in them. When my niece visits from Montana, I’m expected to make a batch of rellenos for her. A couple of weeks ago, I made her a batch of fried ones because that’s the way grandma taught us and it is tradition. And then I got to clean up after frying about two and a half dozen rellenos for four people. My niece and her husband and father got to take the leftovers home. I did manage to stash four away for breakfast the next day. 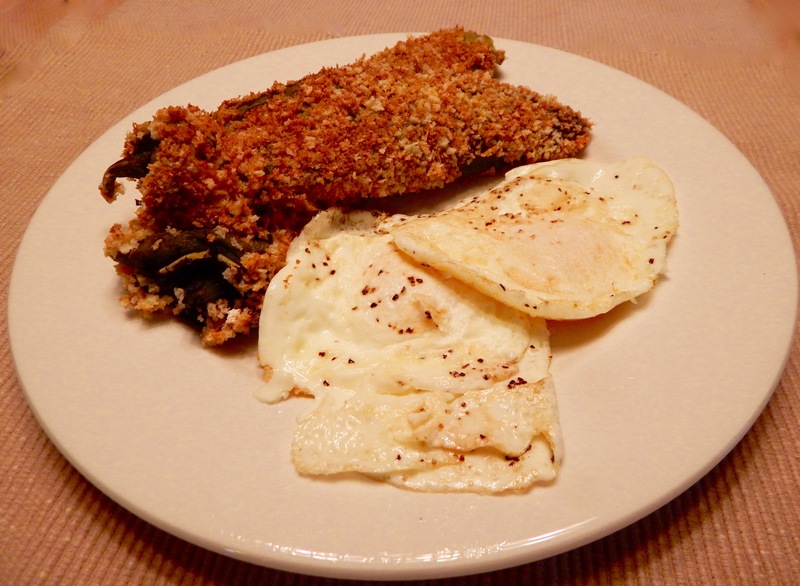 A couple of weeks later, I woke with a craving for chiles rellenos, a favorite breakfast. I didn’t want to fry them because I was just making a few for breakfast. I resorted to my old standby trick – baked rellenos. I poured a pile of Panko crumbs into a sauté pan and toasted them to a nice golden brown. If you don’t toast them, they remain pale and your rellenos look anemic. While the crumbs toasted, I preheated my oven to 375°. I laid out flour on a plate, poured some liquid egg product on a second plate and put the Panko on a third plate. I’ve started using a carton of egg product when I bread something because it is easier to wipe off a carton than to stop everything and whip an egg or two in the middle of breading. I can buy freshly roasted long green chiles year ’round in El Paso. A local market roasts them every day. I just have to take a bag home and peel the blistered skin off them. I put a big bowl of water in the sink and peel and swish my chiles in the bowl. That uses less water than washing them under the tap. Then I slice my cheese to fit in the chiles. We’ve been getting beautiful long chiles lately and it takes a long slice of cheese. I like colby/jack or jack cheese in my rellenos. Plain cheddar gets rubbery when it cools. The chiles are stuffed, then I roll them in flour; next in the egg product and finally a roll in the toasted crumbs. I put the coated rellenos on a rack on a sheet pant and pop them in the oven for about 10 minutes, then turn them carefully and bake about 10 minutes more. The baking melts the cheese and cooks the egg product giving me a nice lightly crunchy rellleno. I keep my rellenos warm after the batch are cooked while I fry eggs to go with them. Sometimes I make refried beans as a side dish, but usually I just have a couple of rellenos and a couple of eggs and call it breakfast. If the chiles are very hot, I can quickly warm up corn tortillas to temper the heat. On the Sunday I made these, I served us each two relines and two eggs. Plates and cutlery went in the dishwasher, pans were given a quick had wash and there was no frying clean up to worry about. And it all came together in under 40 minutes. Panko crusted chiles relines coming out of the oven. Unbelieveable: Tomatillos and Seafood Make Great Green Posole! Thumbing through my foodie e-mails, a recipe for Green Posole with Cod and Cilantro caught my eye. Something that sounds that unusual has to be tried, so off to the store for tomatillos, serrano chiles, clam juice, cod and a few other odds and ends for the recipe. I was ahead of the game with somethings already in the larder. There’s a little chopping in the prep, but isn’t there always? After the chopping you get to use the blender and then it’s a skate all the way with just one good stewpot on the stove. The recipe calls for two serrano chiles. One is chopped and pureed in the soup; the other is sliced thin and used as garnish. A generous sprinkling of sliced raw serrano proved to be too much of a good thing. Should you choose to make this stew, go easy on the raw chile garnish. At first bite, I was afraid the whole dish was too hot to eat. After fishing out the garnish chiles, the stew was just right on the sneezing, tearing and coughing scale of hot things we love to eat: zippy without pain! My supermarket had a special on cod this week and there was one half-pound portion left when I got there, so I improvised and added raw shrimp which I added to the stew when the cod was nearly finished. It was a good decision. 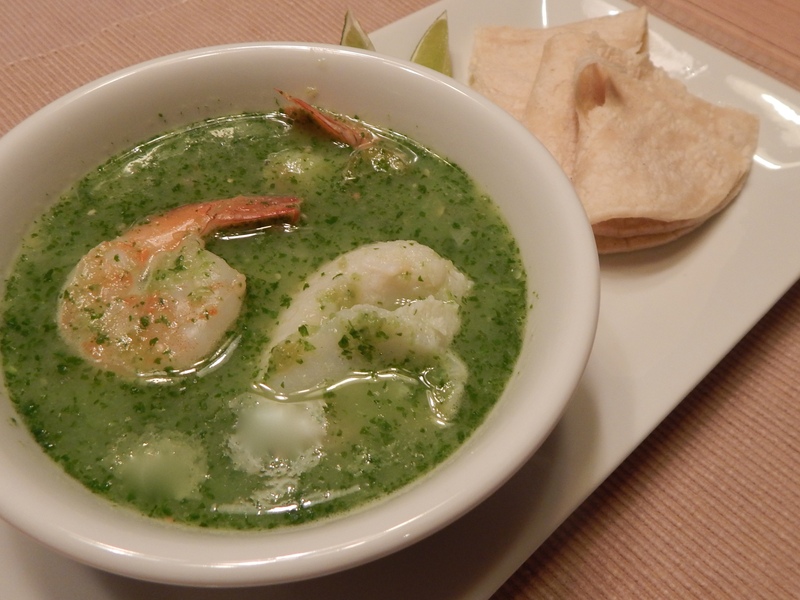 Green Posole with Cod, Shrimp and Cilantro – pre-garnish so you can see the cod and shrimp. On the side, warm corn tortillas with a light schmear of buttah and lime wedges. about 1-1/4 lbs tomatillos (about 8 medium), husks removed and the fruit rinsed. I quartered them before putting them in the blender. Meanwhile, purée tomatillos in blender until smooth. Add half of tomatillo puree to pot and cook until thickened. Season with salt and pepper. Add 1 cup cilantro to remaining purée in blender and blend until smooth; set aside. Add cod, hominy, clam juice and 1 cup water to pot. Bring to a simmer and gently cook over medium-low heat until cod begins to be opaque. Add shrimp and let cod and shrimp finish cooking together and cod begins to flake. Remove from heat. Stir in raw tomatillo-cilantro purée, breaking cod into chunks. Season with salt and pepper. Divide stew among bowls (makes four servings), and garnish with radishes, :cilantro and (at your own risk) remaining chiles. Star slow with the chiles and add more as you can handle them. I eat a lot of chile and the raw serrano slices were very hot. I did have seconds of the stew and added a few chile slices, but not as many as I had the first time! NOTE: To Emily, my vegetarian – I think you could substitute vegetable broth for the clam juice and lightly pan browned cubes of firm tofu and enjoy this dish very much. The tofu would pick up the herbie flavors of the broth nicely.